My photographs fuse performative elements with traditional landscape imagery, in order to explore the metaphoric potential of the environment. My project, Feral, was shot while on solitary kayaking and hiking trips, using a medium format camera and basic camping supplies. 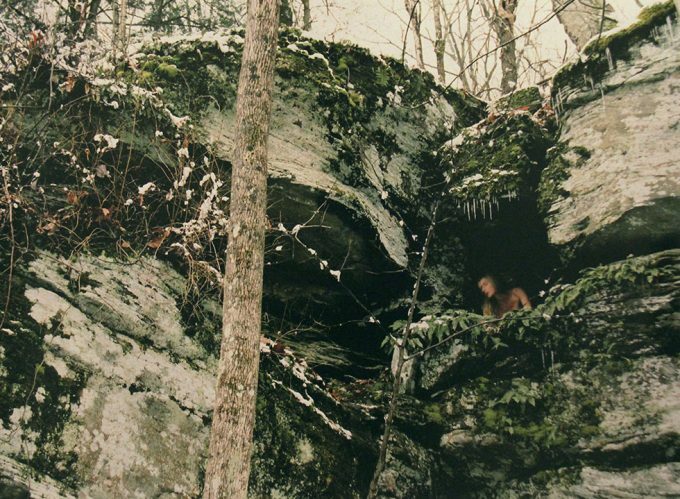 In many works, traces of my body are visible as I merge with, take refuge in, and lose myself in the natural world. In some scenes my body is dwarfed by the primordial landscape, as if swallowed up by nature; in others I dissolve myself, in a rush of water, or am nearly engulfed in a creeping fog. Many photographs reveal evidence of some seemingly paranormal event—a fire burning in a river or an ambiguous, intimate encounter with a fox. These explorations of the unknown landscape suggest a parallel, yet more internal journey, a voyage into the unconscious. In this way, I think of my work as intensely psychological, and each photograph begins to suggest a personal mythology and narratives of metamorphoses. My work builds on photography’s dialogue with memory and mortality, presence and absence.